Westbourne House is a beautiful early Victorian mill owner's house set on its own lovely grounds with private wooded areas for sitting and relaxing. All rooms are en-suite and the price includes full Scottish breakfast. Our family room will easily take up to 4-5 adults. The cost for this room is £80. Westbourne House Bed and Breakfast has delightful and well-furnished bedrooms with very comfortable beds and high quality mattresses and linen. All have garden views and each room has tea and coffee making facilities, FreeSat TV, Hairdrier. Radio alarm clock. Westbourne House is one of the grandest houses in Tillicoultry, reflecting its 19th century association with the Paton family, leading woolen-mill owners and industrialists. Tillicoultry is set amid glorious countryside in the heart of Scotland, with the Highlands, The Trossachs, Loch Lomond, Perth, Edinburgh and Glasgow all less than one hour away by road. All double en suites have a comfortable double bed, colour television and tea and coffee making facilities. En suite Bathroom with shower facilities. All family en suites have a comfortable double and twin single beds, TV and tea and coffee making facilities. En suite bathroom with shower facilities. Breakfast in the B and B is served in the impressive main hall under the sweeping staircase with walls adorned with arts and curios from around the world. We have an 1800's style big old dining room which is open to both guests and non-residents. The reviews on trip advisor for our food has been outstanding and both my husband Ken and myself pride ourselves on offering quality food and accommodation at a fair and reasonable price. available with easy access to front door. Westbourne House and the West Wing at Westbourne House are located in Scotland's smallest county, Clackmannanshire and represents Scotland in miniature; magnificent scenery, rolling hills, fast flowing and gently meandering rivers and ancient villages, set in the very heart of this bonnie land. Beautiful walks and waterfalls can be experienced at Alva Glen and Dollar Glen. Fishing is also available locally on the banks of the river Devon. We have several golf courses within easy reach and Sterling Mills shopping outlet is within a couple of minutes walk for those needing a little retail therapy. Stirling Castle, Wallace Monument and Blair Drummond Safari and Adventure Park are all within 15 mins car drive. There are also cruises available from South Queenferry on the Firth of Forth (45 mind drive) and Edinburgh and Glasgow city centres are an hour's drive away . To be honest, there is a vast range of things to do for both adults and children (pottery classes in alloa) so please do get in touch with me Evie or Ken on 01259 750314. We would be delighted to send more pictures of the house and grounds. As the old capital of Scotland, it is steeped in history, from William Wallace and the battle of Stirling Bridge, through the Battle of Bannockburn where Robert the Bruce defeated the 'auld enemy', to Stirling Castle itself. Haughtily perched atop inland clifftops, the castle has played host to many of Scotland's rulers, including Mary Queen of Scots, and her son, James VI who was christened in the castle, and who later became James I of the United Kingdom. Motorway (M9, M90, M80) connections are within 15 miles. The new railway opened in 2008 gives easy access to Stirling and onwards to Edinburgh in Glasgow in under one hour. Westbourne House is located at 10 Dollar Road, Tillicoultry. Dollar Road forms part of the A91 Stirling to St Andrews road. Westbourne is a very short distance east of the town centre on the north side of the road. We are the third driveway on the left, after the mini roundabout. 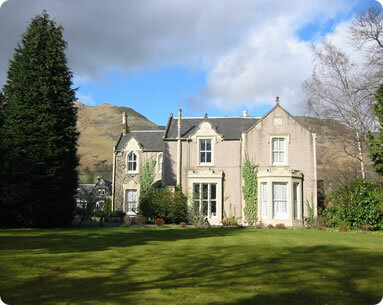 Guest house and bed and breakfast accommodation in and around Stirling. With property descriptions, prices, accommodation details, additional information and lists of facilities, for each property. Contact details are included so that you can check availability and make your booking direct with your chosen bed and breakfast or guest house. Find the best accommodation in the Stirling area, for a family holiday, a short break or a honeymoon in Stirling. The best bed and breakfast or guest house to suit your requirements is here in the in Stirling where to stay guide.